For social marketers, 2015 was an exciting year. New platforms, software and consumer preferences brought about a host of changes and opportunities. 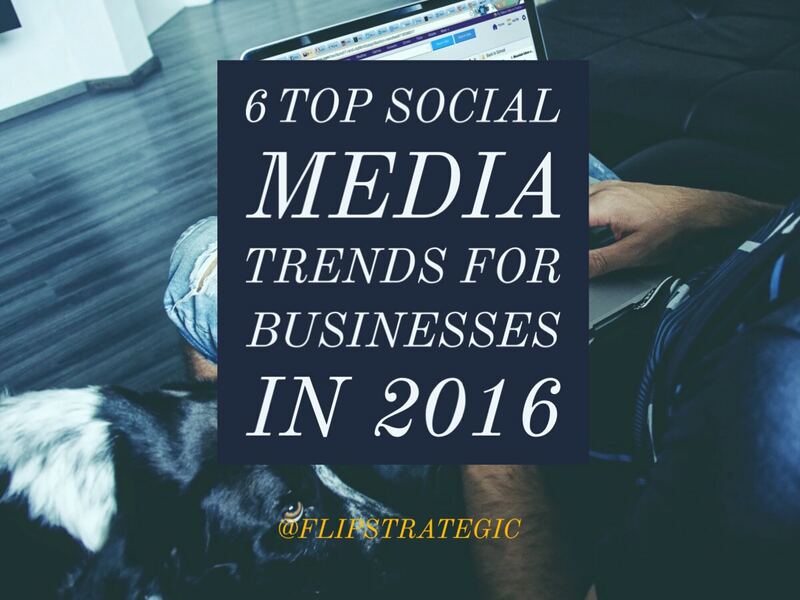 As a result, social media—and subsequently your strategy—has evolved and will continue to do so. Social media thrives on real-time engagement, but each year the window for response becomes smaller and smaller. According to Search Engine Watch, 70% of Twitter users expect a response from brands they reach out to, and 53% want a response in less than an hour. That number jumps to 72% when they’re issuing a complaint. In 2014, consumers complained about brands 879 million times on social media. What’s worse is that in 2015, brands still weren’t responding as 7 in 8 messages to them went unanswered within 72 hours. One of the key strategies marketers need to implement in 2016 is faster response times. Thanks to advances made to social listening and automation tools, if you’re not quick to respond one of your competitors might be. Social media is moving fast, and if your business has a presence on any of the platforms then you’re expected to keep up. Faster response times aren’t the only thing you’ll want to focus on. Consumers also want faster access to real-time, offline events. Live streaming video is considered to be the next big thing in social media marketing thanks to apps like Periscope and Meerkat, which took the Internet by storm in 2015. Social media allows for communication between brands and customers, but live stream goes a step further, revealing a much more authentic side of your business. It’s unedited, unfiltered and shows that you’re not just reading off of a cue card. Both Periscope and Meerkat allow you to broadcast a live stream of the world around you. You can see a more in-depth breakdown of Periscope and Meerkat, including similarities and differences, in one of our previous articles. Neither video service has completely taken over the live streaming space, so both should be considered when creating your social media strategy. One thing to keep in mind is both apps are expected to play a big role in the 2016 Presidential election, so if you’re affiliated in any way, you’ll want to pay close attention to each apps’ strengths and weaknesses. The more engaged your customers are, the better your sales. Over the last couple of years, we’ve seen social media play a crucial role in this area. In fact, in 2014, total US sales that could be tracked to social media reached $3.3 billion. More recently, research found social influences more shoppers’ buying decisions than retail websites. Facebook introduced 360 Ads for immersive experiences. YouTube added 360 Ads for more impactful visuals. Instagram rolled out its action-oriented ad format. Pinterest announced the limited rollout of its Buyable Pins. Twitter continued testing its Buy button. In 2016, you’ll want to explore more ways how you can integrate these features into your social media and content strategies. For inspiration, keep an eye out this holiday season to see how businesses use them. Let’s get one thing clear: content is still king. The mediums might be changing—in 2015 we saw a massive shift from text to media—but the competition for visibility has never been stronger. With more businesses building out their content strategies and the rising advertising costs, optimizing your organic content is at its highest demand. Although social media doesn’t directly influence your search ranking, greater social signals (such as people sharing your content and sending more traffic to your website) can help you rank higher. Why is this important? Because 33% of traffic from Google’s organic search results go to the first item listed. Not just that, but social content is becoming increasingly more visible in search results. Google already has deals in place with Facebook and Twitter—you’ve likely already seen a Tweet or two appear in your search results. In 2016 we’ll see more platforms added to the index, further blurring the line between Web and social media. Your posts on Facebook and YouTube should also be optimized for search. Today 88% of consumers are influenced by reviews and online comments, and they’re turning to these platforms for just that. Searching on Facebook can now turn up public posts, so make sure that yours include relevant keywords and take advantage of character limit and hashtag best practices. What was once considered a bonus is now a necessity. If you’re not thinking mobile first, then you’re already behind. Mobile devices have become the primary (not secondary) screen for most social media users. In 2015, mobile traffic finally overtook desktop traffic in 10 countries, including the US and Japan. As of January 2015, 80% of Internet users own a smartphone. An estimated 2 billion consumers worldwide are expected to own a smartphone by 2016. Additionally, devices like smart TVs and smartwatches saw a spike in popularity, and we’ll continue to see their adoption rise in the new year. What does this mean for marketers? Mobile devices—especially smartphones, tablets and smartwatches—should be a big part of your focus. This is crucial if you’re targeting millennials, of which 87% admitted to never being without their smartphone. More importantly, 14% wouldn’t do business with a company that doesn’t have a mobile site or app. By now much of the guesswork is disappearing from social media. You know who the key players are in the industry. If you’re a highly visual brand, then Instagram and Pinterest are already on your radar. You’re familiar with character limits and image specs. The basics are taken care of, and now you’re ready to refine your strategy so you can really hone in on quality connections. That’s where social media analytics come in. Data is already a big part of how you measure social media success, but it’ll play an even bigger role in your 2016 strategy. Marketers have never had this much access to information about consumer preferences before. This data can help you personalize your message and focus on building stronger loyalty and long-term engagement—rather than short-term acquisitions and individual sales. But let’s be clear about something. Making data-driven decisions doesn’t mean you should let things like follower counts and the number of Likes your posts receive drive all of your business decisions. More importantly, numbers shouldn’t replace creativity. Relationship building is fluid and unique to the individual, whereas number crunching is purely analytical. You need to create a balance between these two approaches in order to be successful. As 2016 continues, it’s important that you and your team take some time to reflect on the past year and all of the changes that it brought. We expect a lot of great changes to come in 2016, but it’s helpful to know what has worked and what hasn’t so you can carry those lessons with you in the new year. Flip Strategic is a leading marketing agency and website design firm located in Greenville, South Carolina. We serve all areas of the Upstate and Western North Carolina, including Greenwood, Anderson, Greenville, Spartanburg, Rock Hill, Charlotte, Hendersonville, and Asheville.